Speaking has two types of tasks: Integrated and Independent. Integrated Speaking requires you to respond orally to a question that is introduced by a short text or an audio clip. Independent Speaking asks you to answer a question based on your own experiences and opinions. There are six tasks in total, and the whole section takes up only 20 minutes. The whole TOEFL takes four hours to complete, so you can see that 20 minutes is not much time. Despite its relative brevity, the Speaking section requires lots and lots of practice. Why? Besides the obvious—you want to get a high score on TOEFL, don’t you?—you need to learn to time your answers right and to control the speed of your speech. You will have, at most, 60 seconds to record each answer, so you cannot speak too fast or too slow. You should also work to improve your pronunciation. As a non-native English speaker, you probably have an accent and that is okay, but working on pronouncing words correctly is essential to get better at speaking English in general, not only for the test. TOEFL Speaking requires you to speak into a microphone instead of talking to an examiner—something to keep in mind and get used to as well. Do I Need to Practice for the TOEFL Speaking Section? Yes, Speaking definitely needs your attention! But what exactly should you be focusing on? The main idea is to know how to form clear responses to questions or topics you are given. For this you need to be able to think of something to say (fast) and then present it (even faster) using good grammar. The grammar does not need to be complex, but it has to be correct. Clear understanding and proper usage of the Simple Past and Present tenses is much more useful to you than getting lost in the verb forms of Future Perfect Continuous. After grammar comes vocabulary. To express yourself orally, you need to have a good arsenal of nouns, adjectives and verbs. For TOEFL Speaking you might not need to study vocabulary specifically, but it is a good idea to pay attention to it. You should learn a few fancy words, but you should never use words whose meaning is unclear to you. Play it safe! Practicing for Speaking requires that you time your responses. They need to fit into the time limit specified by each Speaking task—anywhere from 15 to 60 seconds. You need to cover all the points you want to make within this short time! However, you also do not want to run out of ideas and submit a 10-second response to a task that gives you a full minute to talk. Last but not least, your pronunciation is also something you need to focus on. Note that it is not your accent that matters. You can have an accent! However, you must focus on pronouncing words clearly and to the best of your ability, so that people can understand you well. Every ESL speaker has some kind of accent. It is best to stop worrying about it early on and focus on points discussed above. Now, there are lots of ways you can prepare for TOEFL Speaking, and the best is practice and more practice. Here are some ideas on how to get talking before your test! This is the most structured way you can go about practicing for the Speaking section. You can choose topics that match the TOEFL exam pattern and standards. You can focus on your weaknesses that need the most work. For example, if you have trouble responding in a certain time limit, then you can spend extra time working on being able to form an answer in under 30 seconds, or on speaking slowly enough despite being nervous. You can also study in the location where you feel most comfortable talking and repeating things, for example, you can practice at home or in the privacy of a library study room. You can go at your own pace, laugh at how awkward your voice sounds on the recording and re-try any speaking task you want. To set up studying by yourself, you will need a pair of headphones and a microphone, both of which connect to your computer or laptop. You will also need a simple recording software (Audacity is a great free tool). Once you compile a list of TOEFL-appropriate topics, you are good to start speaking! When you practice, record and play back your answers. Take note of any grammar mistakes, pauses, umm‘s and hmm‘s. Notice how you tend to speed up if you are nervous or see the time running out. Your speed of talking is important, but the timing of the response is even more crucial. Regularly practicing these by yourself is optimal. You probably already know that there are tutors out there who teach English to students. But did you know that there are many tutors who specialize in teaching English for the TOEFL exam? They know all about the exam and how to improve your score. With a private tutor, you can take and review practice tests, drill vocabulary, discuss grammar topics and work on any weaknesses that you may have. It’s all about you and your needs! To find the right tutor for you, you can start by searching online with Verbling. There are many English tutors with experience in teaching about the TOEFL. Verbling tutors teach online, not in person. If you would like to see your TOEFL tutor in person, at your house or somewhere like a local cafe, then you can use Wyzant (only in the United States). This website will help you find the best TOEFL tutor for you, who also lives in your local area. This is a more social experience that has several unique advantages. 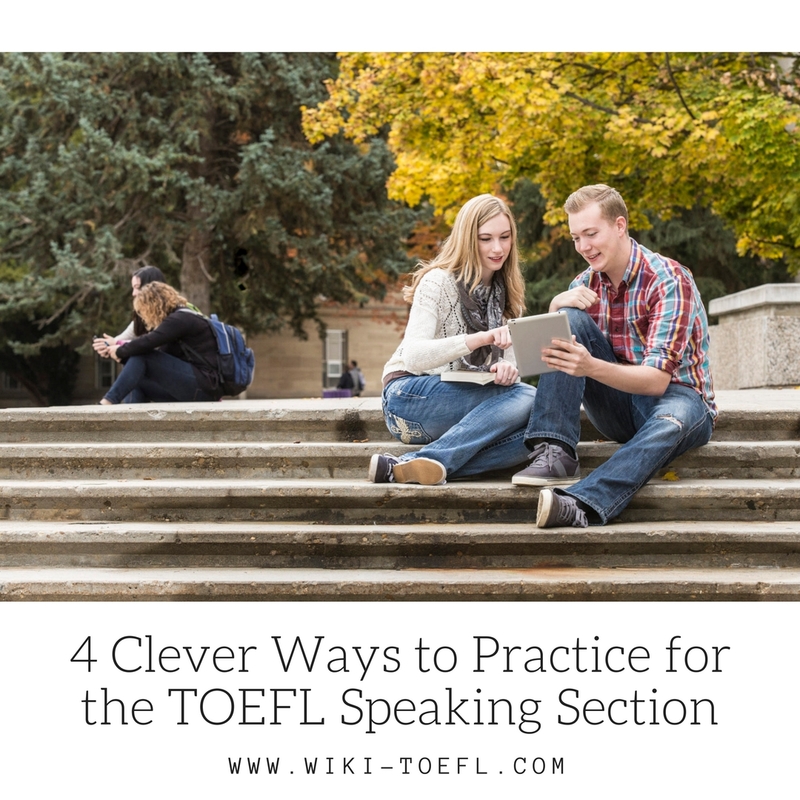 If you can get together with a few more TOEFL-takers, you will be able to practice for the Speaking section in a more natural way. TOEFL Speaking is a monolog task, where you will speaking all by yourself, alone. However, you can structure your sessions with a study buddy as dialogues which help both speakers practice at the same time. You will also be able to get feedback from peers on your pronunciation, on what is clear and what is not. You can agree to time and record your answers and try again, if necessary. You can give each other feedback on the recordings and give suggestions for improvement. It is a study group, after all! The difficulties with studying in a group are mainly logistical. The group dynamics may make it hard to practice with a microphone (since you can do it by yourself, you do not need a group for that), and you might need to share the microphone if you study with other people. Another difficulty is actually finding people to study with. You may form a group of like-minded people for free, say, friends who might also be taking TOEFL or students at your current school. Alternatively, you can sign up for TOEFL preparation classes and have not only a study group, but an instructor to mentor you as well. If you can afford these, great. If you cannot afford these options or prefer to save money, you can also go online and find people in your area who want to practice before TOEFL for free (check out StudyPal.co, for example). They do not have to be people you know. You might even make new friends that way! To make practicing in a group setting effective, make a list of TOEFL-appropriate topics, agree on how your conversations are going to go, and alternate between dialogue and monologue exchanges. If you can, invite a native English speaker to oversee your session at least once before the test. Ask for her feedback regarding your skills, and you will be able to adjust your study strategy accordingly. The goal of TOEFL is to ascertain you can communicate in English clearly. It is, however, a very specific test that cannot measure your ability with a 100% accuracy. Speaking English “in the wild” is a very important skill that will benefit you long after you have successfully survived TOEFL. Therefore, practicing English in a relaxed social setting with native speakers is a great addition to your study sessions. The opportunities are truly limitless, especially if you live a big city. You can go to a regular gathering of people who wish to practice foreign languages—English will surely be at the top of their list. You can go to a specific English-language Meet Up (check out your local Meetup.com listings). You can also socialize with the expat and travel community in your city: Events organized by travelers are among the friendliest to new people (see Couchsurfing.org and their events). The advantages of practicing Speaking this way are obvious: You are exposed to so much English that you become used to it very quickly and lose the fear of speaking bit by bit. It is an excellent way to practice speaking and listening at the same time, which is very useful for TOEFL. And best of all, these types of events are usually free or very inexpensive to attend and they happen regularly. Practicing English socially cannot substitute studying for the Speaking section formally. For one, you will not always be able to choose topics that you need to practice. Timing or recording your dialogues is also out of the question for these more casual events (you do not want to scare people away). What you can do, if you find yourself in a social situation speaking English, is give yourself small tasks that will help your TOEFL preparation. For example, make it your goal to use one or two new words you have just learned in conversation. Try to start a little discussion on the TOEFL topic you recently practiced. Observe how people react to you speaking and note if they have difficulty understanding you. A social situation can be a great addition to your more formal studying sessions. See, you can have some fun with it and practice your English speaking too!